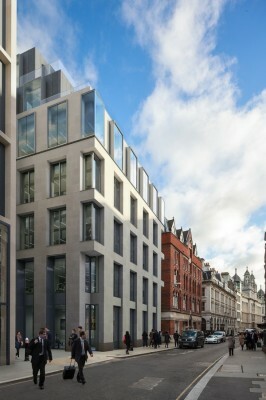 40 Chancery by Lane by Bennetts Associates – Holborn, central London, England – Mixed use building – Workspace/office and retail – is one of winners announced for the London region. 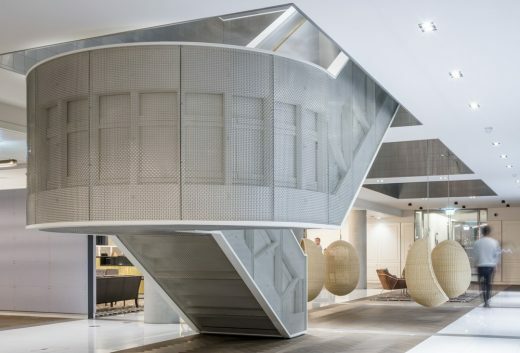 Following the fit-out by architecture and interior design practice, Jump Studios, the space is now the new home to globally renowned advertising agency, Saatchi & Saatchi. Sitting on the site of former mid-20th Century buildings, the space incorporates original fragments of one of the existing Took’s Court buildings. Took’s Court features as “Cook’s Court” in Dickens’ Bleak House. Retaining the streetscape geometry, carefully calibrated vertical window recesses align with original street levels. Inside, a day-lit atrium separates the new and old – making a showcase of the existing Took’s Court brick fabric. Onciato travertine marble was chosen as the predominant façade material, to complement its neighbours built in Portland stone. 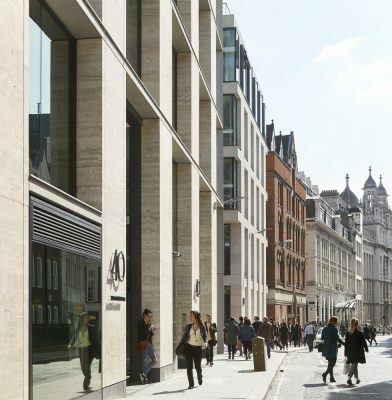 The historic, street legacy of narrow passages leading to open spaces and courts is echoed in the new 40 Chancery Lane by the inclusion of a landscaped courtyard, for tenancy use. With office space on three sides of the courtyard, the fourth wall hosts a series of vertical, slatted, timber screens and outdoor seating along the boundary of neighbouring buildings. 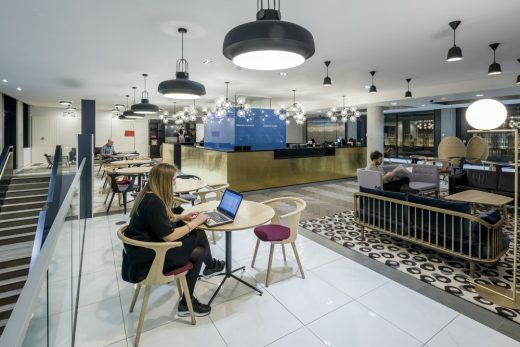 Over the building’s seven floors, Bennetts Associates has ensured the ‘Category A’ fit-out is designed to adapt to the space requirements of its tenants. Structural columns are strategically placed to minimise impact on the floor plates, and fresh air supply is localised with individual, opening windows. Artist Susanna Heron has created a series of tall, incised panels within the travertine-clad flank wall to the passageway between Chancery Lane and the courtyard, inspired by the overlapping stems of the birches found in the courtyard. 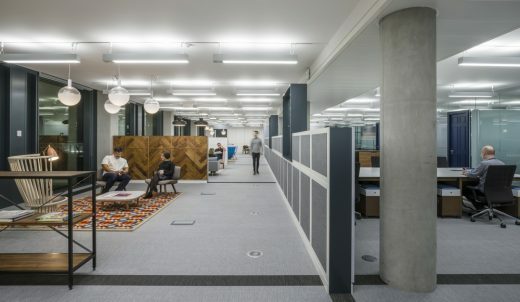 Sustainability targets of BREEAM Excellent were set, and achieved, meaning the project makes significant carbon reductions compared with today’s typical speculative office development. The scheme has since won an RIBA London Award 2017. 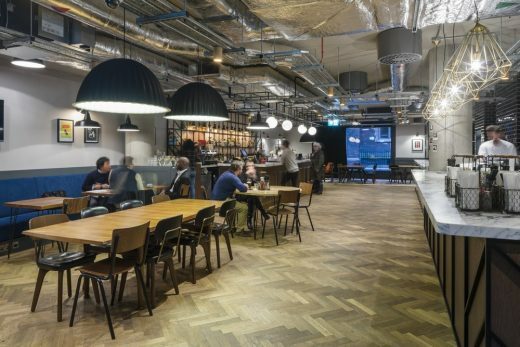 Chancery Lane is the latest addition to Bennetts Associates’ portfolio of commercial projects in the capital. 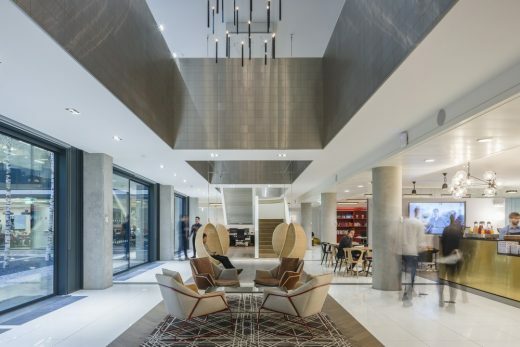 Other projects include the recently completed One Bedford Avenue on Tottenham Court Road and 11-21 Canal Reach, a Grade A development in King’s Cross for Argent which has been designed to meet BREEAM Excellent. 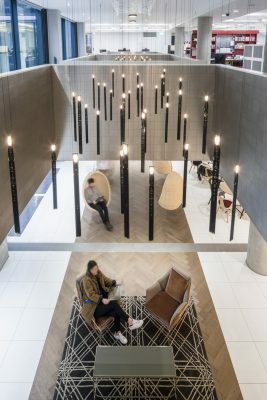 Architecture and interiors practice Jump Studios, a Populous Company, has delivered a new London office for Saatchi & Saatchi, the renowned global communications and advertising agency. 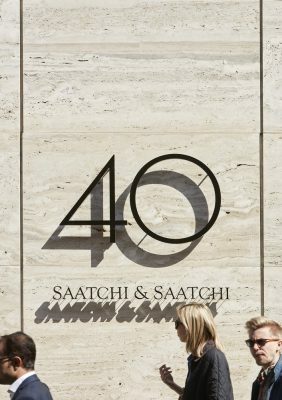 Situated in the heart of London’s legal district on a large corner site, 40 Chancery Lane will be the new London home for Saatchi & Saatchi, which is part of the Publicis Groupe, meaning the agency will be leaving its offices at 80 Charlotte Street in Fitzrovia after more than 40 years. Working closely with Saatchi & Saatchi, Jump Studios has taken the 100,000 sq. 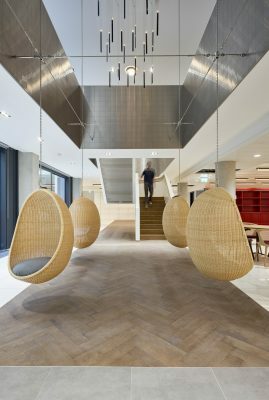 ft, seven storey blank canvas provided by this Bennetts Associates’ designed, Derwent London development, and created a bespoke and welcoming workspace that evokes the spirit of Saatchi & Saatchi as soon you enter the building. 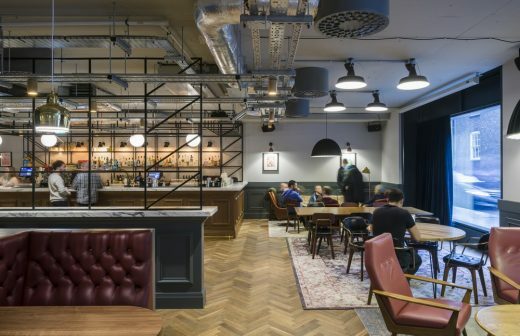 In doing so, they have also found space to re-open the agency’s in-house Charlotte Street pub, The Pregnant Man; named after Saatchi & Saatchi’s much celebrated 1970 campaign for the Family Planning Association. Entering through a landscaped courtyard off Chancery Lane, the company’s employees and their visitors will be welcomed by the exact same stone step from the 80 Charlotte Street entrance, incorporating the famous Saatchi & Saatchi motto “Nothing is Impossible”, which has been moved to the reception area of the company’s new home. Looking up from the courtyard they will also see this statement repeated in large steel letters affixed to a fifth floor entertainment terrace. 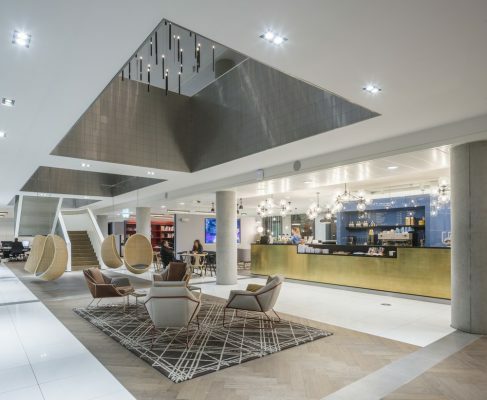 Inside, a traditional ground floor reception area has been dispensed with in favour of an open plan social hub that enables visitors to mix with employees as soon as they arrive and gain immediate insight to the philosophy of Saatchi & Saatchi and its creative approach. 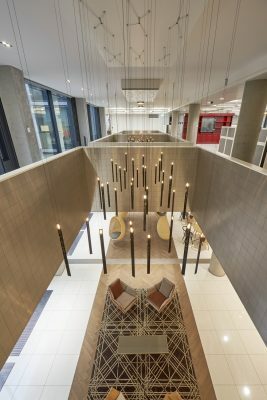 The reception area is intended to reflect a more open and collaborative working space than the enclosed welcome of more traditional offices, with a central bar and café area dominating the entrance space. 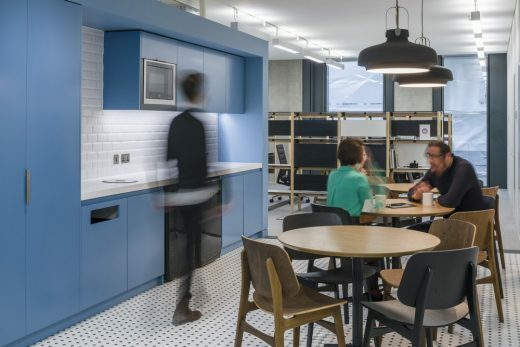 Moving away from the more cellular and partitioned feel of the agency’s former Fitzrovia HQ, Jump Studios has designed an open plan space that is informal, stylish and practical in equal measure. ‘British with a twist’ is the theme that underpins the design approach, which Jump Studios has conceived in order to bring Saatchi & Saatchi’s unique character to life. 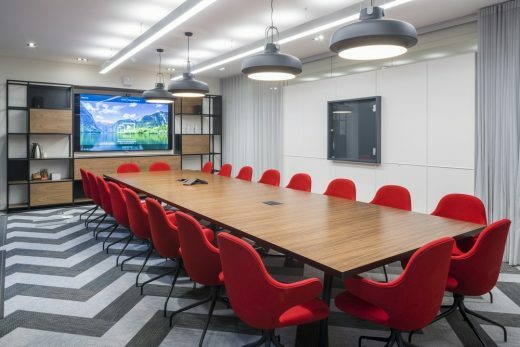 From bespoke herringbone Bolon flooring in the boardroom which overlooks the courtyard to wainscot panelling upholstered in houndstooth cloth lining the office walls, different materials and patterns have been employed to catch the attention and provoke a reaction, similar to the agency’s work. 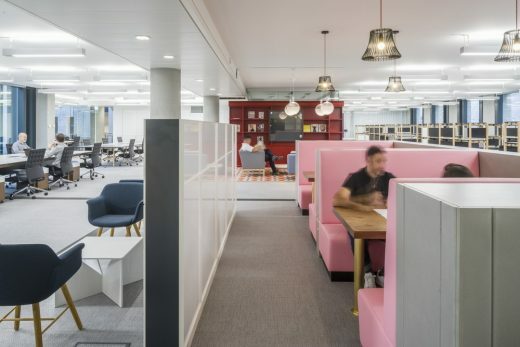 High spec and bespoke lighting, furniture, flooring and finishes have been combined to distinguish neighbouring areas for different activities without the need for floor to ceiling partitioning. 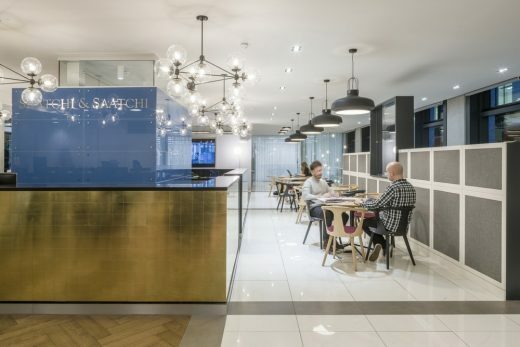 A range of mid-century furniture and lighting gives a stylish feel to the social space throughout, whilst bespoke finishes, such as the individually assembled brass tiles encasing the reception bar, reflect the required level of detail in everything Saatchi & Saatchi does. 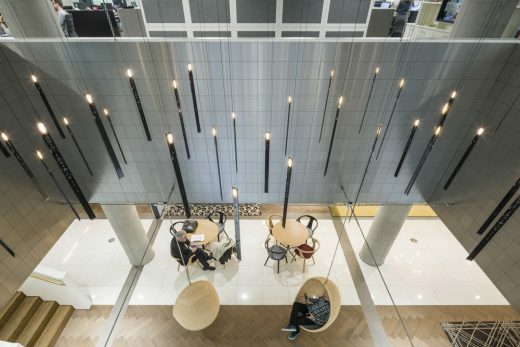 Reflective steel tiles cover a central void which is illuminated by stunning candle effect lighting by renowned industrial designer Ingo Mauer, suspended from the ceiling of the first floor. 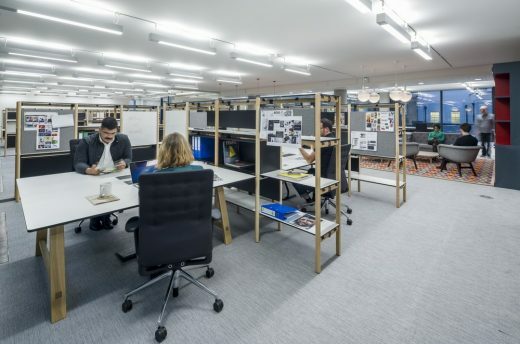 Jump Studios has worked together with Belgian furniture design company Bulo to create bespoke desks and shelving units for a variety of work stations. The units have been designed with a modular system, incorporating writeable and pin-able panels for brainstorming and collaborative working. 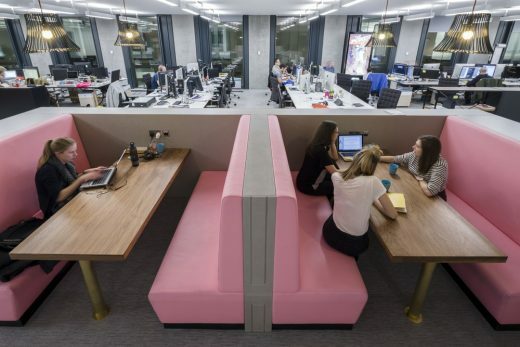 Flexible seating is positioned on each floor, with bespoke pink leather booths designed by Jump Studios, encased in pre-cast concrete and walnut tables aside data and power connection points, providing space for employees to ‘break out’ but still work collaboratively within the office. 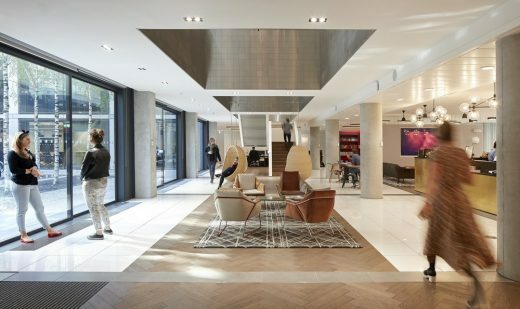 Jump Studios’ work has also extended to the neighbouring Tooks Court, a 19th Century building that was retained as part of Derwent London’s re-development at 40 Chancery Lane. 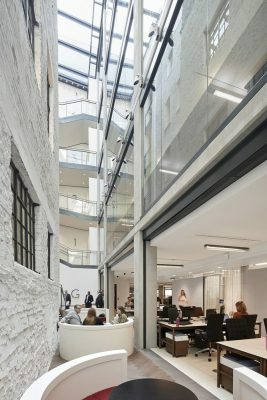 The listed space was refurbished and incorporated into the new construction around an internal atrium. 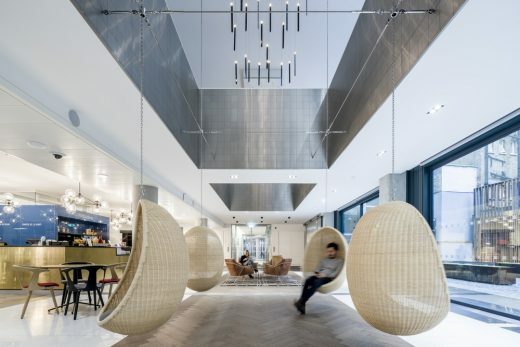 This will be the new home of Fallon London, the creative agency also owned by Publicis Groupe. 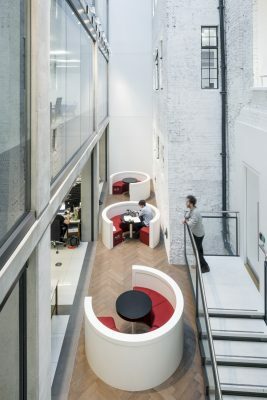 Jump Studios (a Populous company) is an award-winning architecture and interior design practice based in London. 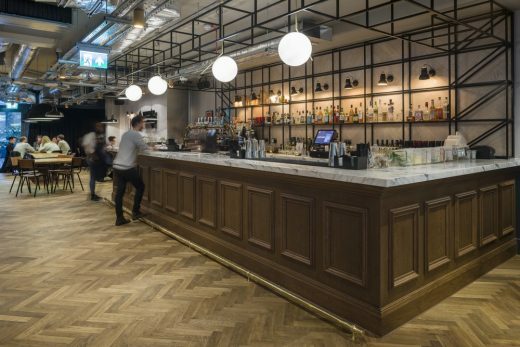 Encompassing retail, workspace, exhibition, brand experience, pop-up, restaurant and bar design, Jump Studios has established an impressive client list including Google, Nike, Rapha, Bloomberg, and Starwood Hotels.